For many, work involves sitting at a desk while working on a computer and using the telephone balanced on your shoulder while typing. This causes tension to build up in the neck and shoulder muscles. This is only one example of repetitive tasks performed during a normal working day. 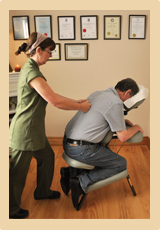 Cloghans Therapy Centre provides On-Site Chair Massage in the workplace. The therapist works on the upper body, shoulders, neck, arms and hands while the person sits comfortably, fully clothed in a specially designed massage chair. No oils are used and treatments vary between 20 and 30 minute sessions so they can be easily fitted in on a break. When your treatment is finished you can go back to work feeling rejuvenated and refreshed but most importantly muscles feel free and loose. On-Site Chair massage is mobile and convenient. It helps reduce absenteeism, increase productivity and raise morale in the workplace. If you would like to find out more or book on-site chair massage in your workplace, please contact us.